The Almaty Grand Prix 2016, the last open qualification event for the Rio 2016 Olympic Games, opened with the eyes of the sporting world watching judoka suffer heartache and delight in equal measure on Friday at the Baluan Sholak. For those who are superstitious, Friday 13th, was inevitably an unlucky experience for some but for the winners the Greatest Show on Earth will await them this summer in Rio de Janeiro. Athletes on the cusp had one last chance in Almaty with the Olympic qualification race closing after the invite-only World Judo Masters in Guadalajara, Mexico, from 27-29 May. The incentive for the majority of the field was like no other competition in their careers and an exceptional few were able to outstrip all of their previous accomplishments to move into qualification positions for the Olympics. The vast entry was also lifted by a host of leading countries sending their back-up choices for the Games to cover themselves for every possible scenario by ensuring their seconds are ready to fight should such an opportunity present itself as it does every four years. On day one in Almaty, the competition opened with the women’s -48kg, -52kg and -57kg categories and the men’s -60kg and -66kg categories. A Grand Prix gold medal has never had more value than today as the 300 points for gold, 180 for silver and 120 for bronze, propelled new names towards the Olympics and pushed others out of contention. 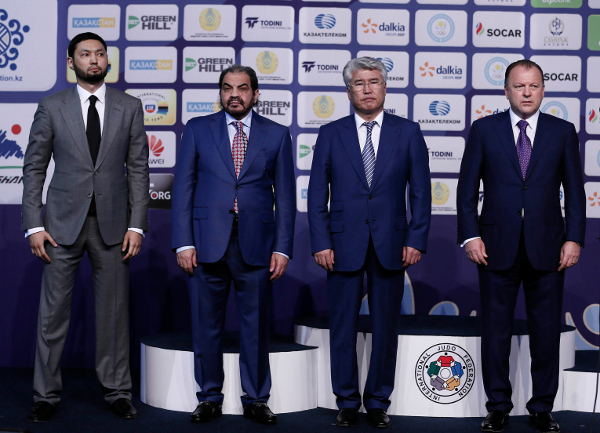 Before the final block, Mr. Marius VIZER, IJF President (below- left), joined Mr. Bauyrzhan Baibek KYDYRGALIULY, Mayor of Almaty City, Mr. Arystanbek MUHAMEDIULY (below - right), Minister of Culture and Sports of the Republic of Kazakhstan, Mr. Obaid AL-ANZI, IJF Vice President and Judo Union of Asia President, along with Mr. Kenges RAKISHEV, Kazakhstan Judo Federation President, to open a new state-of-the art Kazakhstan Judo Academy in the city. 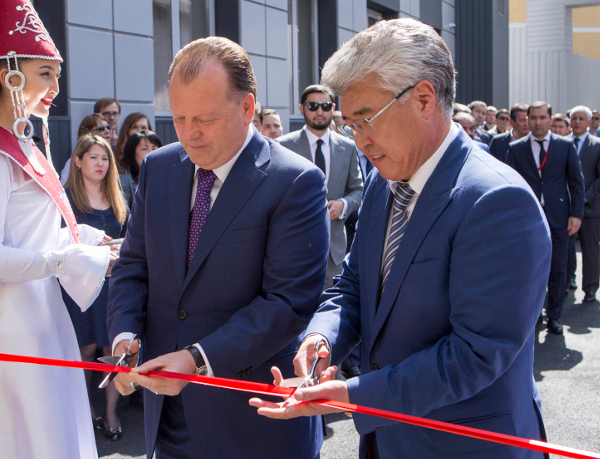 In front of a mass of national and international media, Mr. VIZER and Mr. MUHAMEDIULY, cut the red ribbon at the entrance of the new Academy to officially open the facility. 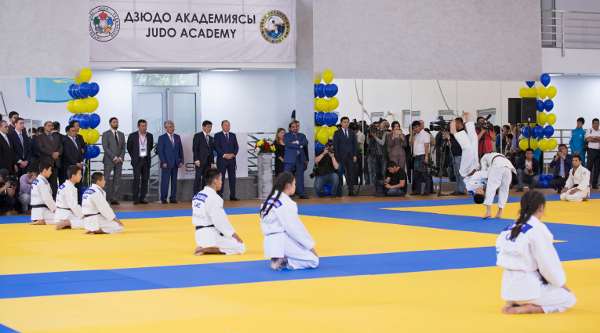 The guests of honour greeted the media, judoka and officials with a few words before members of the Kazakhstan youth teams provided a demonstration of their skills on the new tatami. 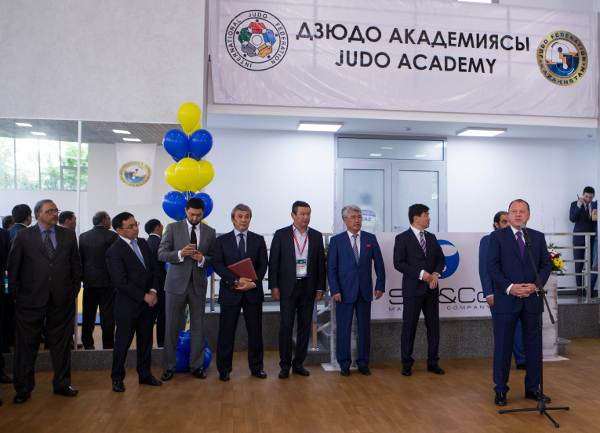 The Almaty Grand Prix opening ceremony was held following the new Academy opening as the delegation arrived at the competition venue. Mr. Arystanbek MUHAMEDIULY, Minister of Culture and Sports of the Republic of Kazakhstan, said: “It is a pleasure to have such a major sports event here in Almaty. I would like to thank the IJF President Mr. Marius VIZER and for the trust placed in us to host the World Championships last year in Astana. I thank you all very much and I wish good you all good luck." Mr. Marius VIZER, IJF President, said: “Dear Mr. MUHAMEDIULY, Minister of Culture and Sports of the Republic of Kazakhstan, dear Mr. AL-ANZI, President of the Judo Union of Asia, dear representatives of the Kazakhstan Olympic committee, dear Mr. RAKISHEV, Kazakhstan Judo Federation President, dear judo family members, dear guests and media representatives, today we had the honour of inaugurating one of the biggest and most spectacular academies in the world. “I want to congratulate Mr. RAKISHEV for this and the continued work and achievements of the Kazakhstan Judo Federation. I would like to thank all the 83 delegations taking part in the Almaty Grand Prix and I wish you all a lot of success and good luck not only in this event but also at the World Judo Masters and the Olympic Games. Click here to subscribe to our new notification service – login with your Facebook account and you can receive notifications when your favourite judoka or country is competing. World number three Otgontsetseg GALBADRAKH (KAZ) defeated Dusseldorf Grand Prix winner JEONG Bo Kyeong (KOR) in the -48kg final to strengthen her grasp of a seeded position for her first Olympic Games. JEONG was targeting gold to close in on a seeded position at the Olympics having started her day positioned 11th on the Olympic qualification list. GALBADRAKH has now medalled in all seven of her 2016 events including gold at the Paris Grand Slam. The Kazakh dynamo is only behind former world champion MUNKHBAT Urantsetseg and world champion Paula PARETO (ARG) and went some way to closing that gap by seeing off JEONG on shido penalties. The South Korean was penalised for the second time with five seconds left which kept the gold medal in Kazakhstan as GALBADRAKH was only penalised once. In the first semi-final GALBADRAKH dominated Tbilisi Grand Prix bronze medallist Maryna CHERNIAK (UKR) despite only winning by a shido. An onslaught from the Kazakh fighter captured the imagination of the home crowd who roared on their fighter against the Ukranian who at the start of the day was qualified for the Olympics but only via continental quota which is subject to change until the end of the qualification period in two weeks’ time. GALBADRAKH was the first home fighter to guarantee a medal and had too much for her opponent throughout their battle. In the second semi-final European bronze medallist Dilara LOKMANHEKIM (TUR) who started her competition in 13th place on the Olympic qualification list lost out to JEONG. 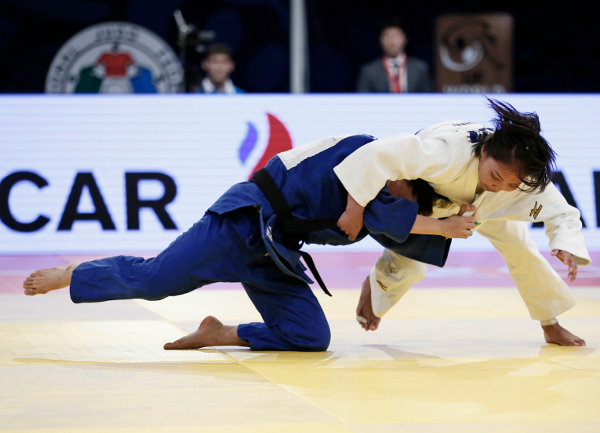 LOKMANHEKIM, who has seemingly won the domestic battle with Ebru SAHIN for their -48kg Olympic place, was penalised with a shido as JEONG was a constant threat with committed attacks in the form of her ippon seoi-nage and sode-tsurikomi-goshi. A yuko for JEONG was the only score in the four minute contest which set in stone an all-Asian -48kg final. The first bronze medal contest was won by Pan American Championships bronze medallist Nathalia BRIGIDA (BRA) who defeated LOKMANHEKIM. The Turkish fighter was penalised with a shido for gripping for too long on one side without attacking and that decided the scoreless contest. BRIGIDA, 23, who was 19th on the Olympic qualification list, had the hardest task of all during this cycle with the reigning Olympic champion Sarah MENEZES as her teammate. There was a time when BRIGIDA was in contention for her home Olympics as the pressure and expectancy on the shoulders of MENEZES saw her endure a difficult spell on the IJF World Judo Tour as results were hard to come by. BRIGIDA meanwhile has been a very worthy competitor for her country in her own right and despite MENEZES returning to form, the young Brazilian could be the leading candidate for Tokyo 2020. The second bronze medal was won by beaten semi-finalist CHERNIAK who defeated 29-year-old ippon seoi-nage specialist Dayaris MESTRE ALVAREZ (CUB). The first moment of note came when MESTRE ALVAREZ was penalised with a shido for a false attack. CHERNIAK took the lead with a waza-ari after two minutes and added a yuko score from a ko-soto-gake. MESTRE ALVAREZ failed with a sode-tsurikomi-goshi and was penalised for an overly defensive posture in the next exchange before CHERNIAK was reprimanded for a gripping infringement. 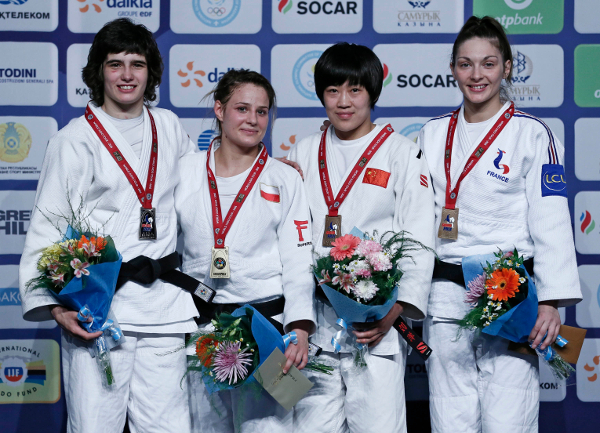 Former Paris Grand Slam silver medallist Evelyne TSCHOPP (SUI) was one of the biggest winners of the day as the outsider bested Baku Grand Slam winner Gili COHEN (ISR) in the -52kg final. TSCHOPP (SUI) started her competition placed 24th on the Olympic qualification list and had to medal to keep alive her Olympic dream. A superb gold medal, which came from a kesa-gatame hold for 20 seconds, lifted TSCHOPP up into contention for the qualification zone and such was her delight that she was unaware of an added bonus of a place in the record books. The 24-year-old became the first Swiss woman to win gold at an IJF Grand Prix and could now be in line for an invitation to the World Judo Masters. In the first semi-final Baku Grand Slam winner Gili COHEN (ISR) saw off world bronze medallist Darya SKRYPNIK (BLR) who was in a continental quota position at the start of day one five points off qualifying by right. 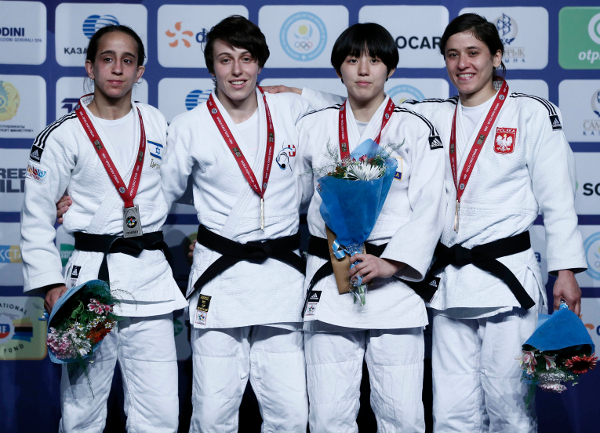 COHEN had a spring in her step and was too forceful on the ground for her rival who could not escape a ushiro-kuzure-kesa-gatame as the Israeli sealed a second consecutive final on the IJF World Judo Tour in the space of a week. In the second semi-final TSCHOPP beat former Ulaanbaatar Grand Prix winner PARK Da Sol (KOR) who was hoping to earn a spot for her team at the Olympics. Surprise contender TSCHOPP threw PARK for a waza-ari and held down the 20-year-old South Korean with a ushiro-kuzure-kesa-gatame for 15 seconds and a spot in the final. The first bronze medal was clinched by PARK who beat two-time Grand Slam winner Jaana SUNDBERG (FIN) who has fallen away at the worst time possible time, lying down in 29th place on the Olympic qualification list. PARK defeated SUNDBERG by a yuko score to earn 120 points for bronze but is still be a large distance off qualification and will rely on an invite to the World Judo Masters which would only be offered if the judoka above her elect not to compete. 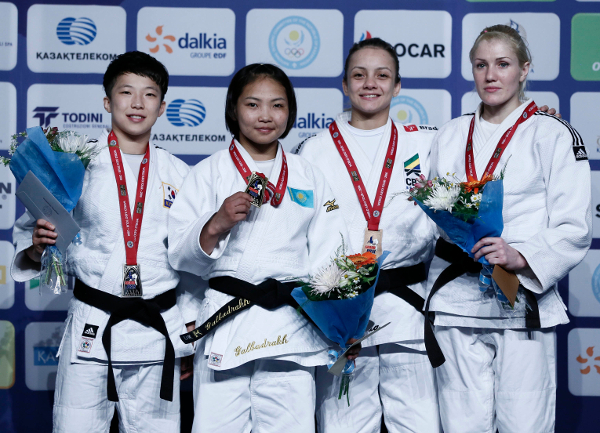 The second bronze medal was won by two-time Grand Prix bronze medallist Agata PERENC (POL) who beat SKRYPNIK for the final place on the -52kg podium. PERENC took control of the contest with a left-sided drop seoi-nage which is always one of her most successful techniques. The Polish team are out in force in Almaty and they were a regular feature in the final block on day one. 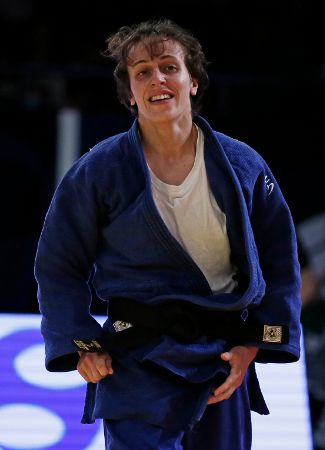 Former Tashkent Grand Prix bronze medallist Arleta PODOLAK (POL) defeated Buenos Aires Pan American Open winner Jaione EQUISOAIN (ESP) to win -57kg gold and is now hopeful of an invitation to the World Judo Masters. PODOLAK entered the competition as the number 27 on the Olympic qualification list and won her first Grand Prix gold medal with a display of power and precision. The Polish fighter went ahead of with a waza-ari from an ippon seoi-nage out of nowhere and then made sure of her first Grand Prix title by submitting her Spanish opponent with a juji-gatame. In the first semi-final European champion Automne PAVIA (FRA) fell to EQUISOAIN after 46 seconds of golden score as the latter executed a harai-makikomi for a match-winning waza-ari score and a guaranteed place on the podium. In the second semi-final PODOLAK (POL) defeated 21-year-old European Championships bronze medallist Timna NELSON LEVY (ISR) by ippon after only 44 seconds. The first bronze medal was won by former Qingdao Grand Prix bronze medallist LIU Yang (CHN) who controlled NELSON LEVY on the ground by wrapping up the Israeli to the extent that the latter had to submit. NELSON LEVY had a tame uchi-mata effort which was more of a prodding attack but failed to create any opening. LIU persevered in ne-waza and there was always progression in her work which allowed her the time to trap NELSON LEVY with a vice-like sankaku-gatame and tap out was instant. The second bronze medal was won by PAVIA against former world bronze medallist and world number 18 Sanne VERHAGEN (NED). Their clash could have been a medal contest on any stage given their talent but it was PAVIA who showed the better judo as she shaped up for harai-goshi but finished with an attack more becoming of an uchi-mata. Italian upstart Elios MANZI (ITA) shone on day one as his ambition and ability could yet guide him to the Olympics four years earlier than originally planned. The 20-year-old European Championships bronze medallist looked completely detached from any emotional investment as he faced off with world silver medallist Rustam IBRAYEV (KAZ) with maturity beyond his years and beyond his experience. MANZI was in 60th place on the Olympic qualification list this morning but he picked off all five opponents to stand on top of an IJF podium for the first time. The Italian scored two yukos without reply as IBRAYEV was denied while Kazakhstan’s reigning -60kg world champion Yeldos SMETOV (KAZ) was rested and watched from the stands. In the first semi-final world silver medallist IBRAYEV blocked the passage of Baku Grand Slam bronze medallist Diyorbek UROZBOEV (UZB). IBRAYEV won by ippon from a juji-gatame as he gave his opponent a masterclass having fought off the same technique from the Uzbek earlier in the contest. In the second semi-final MANZI surpassed Sharafuddin LUTFILLAEV (UZB) by a yuko to fast-track his Olympic dream as he was assured of a medal at this stage. The first bronze medal was claimed by LUTFILLAEV who bested Tyumen Grand Slam bronze medallist Aibek IMASHEV (KAZ). The rivals’ accidentally had a coming together as they went to the ground and IMASHEV received some treatment for a bloody nose before returning to continue his home bid against his near neighbour from Uzbekistan. 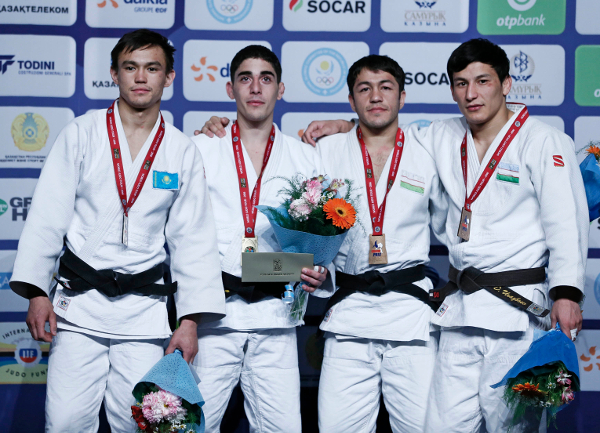 LUTFILLAEV produced the only score of the contest and that waza-ari gave Uzbekistan the first medal in the -60kg category as both judoka showed their respect and sportsmanship which was applauded by the Kazakh crowd. The second bronze medal in the men’s lightest weight category also matched hosts Kazakhstan against Uzbekistan. 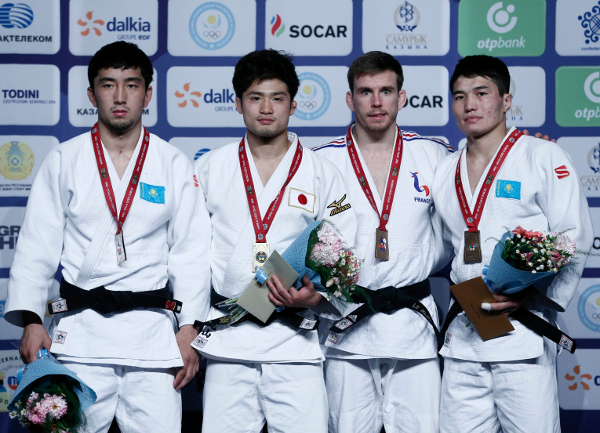 The outcome was the same as the medal will leave Kazakhstan with UROZBOEV who defeated Tyumen Grand Slam bronze medallist Askhat TELMANOV (KAZ). 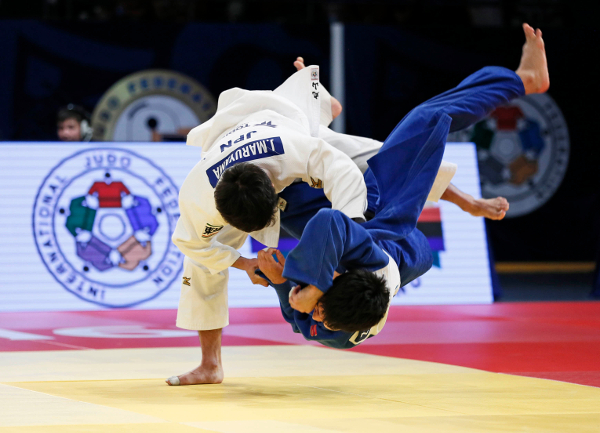 Both judoka were penalised for not taking a grip before the Uzbek received a second shido which was given for his passivity at the halfway stage. UROZBOEV and TELMANOV scored a yuko apiece and finished the five minute contest with two shidos also on their records which meant that golden score would follow. After 74 seconds of added time it was UROZBOEV who came through as he threw TELMANOV with a tomoe-nage for waza-ari and bronze to the frustration of the crowd. Japanese newcomer MARUYAMA Joshiro (JPN) won all five of his contests on his Grand Prix debut to capture an impressive gold medal and can now relax and prepare to watch his older and more accomplished brother MARUYAMA Goki (JPN) in -81kg action on Saturday. Japanese head coach INOUE Kosei is in town with his two-man team as he will coach the MARUYAMA brothers on successive days. MARUYAMA Joshiro, 22, had made his one and only previous appearance on the IJF World Judo Tour in 2013 when he finished seventh at home at the Tokyo Grand Slam. The Tenri University member has fully recovered from a run of injuries and based on today’s showing could become a fixture in the Japanese team going forward. The young Japanese fighter launched SMAGULOV into the air with a uchi-mata – a technique which is shared by his brother and most famously by his coach in Almaty – for a yuko score and that was the only time the scoreboard was called upon. In the first semi-final MARUYAMA defeated Yeldos ZHUMAKANOV (KAZ) by ippon while in the second semi-final former world silver medallist Azamat MUKANOV (KAZ) lost out to teammate Zhansay SMAGULOV (KAZ) on shido penalties 2:3. 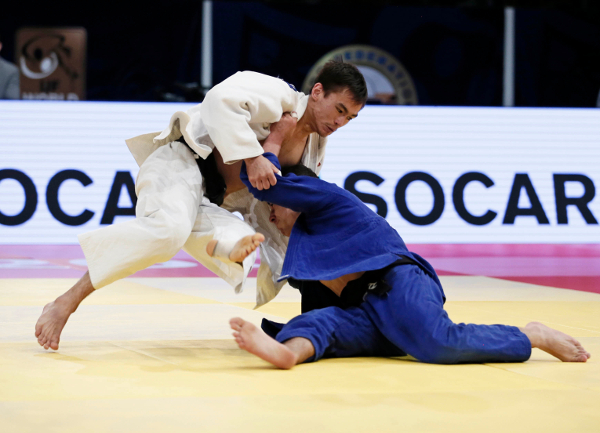 The first bronze medal was won by Paris Grand Slam bronze medallist Kilian LE BLOUCH (FRA) as MUKANOV endured a torrid contest as he was penalised on four occasions to receive hansoku-make and gift the medal to his French opponent. MUKANOV led with a neat piece of ashi-waza but lost his way after that as he looked to use up the clock but it backfired and it was the Frenchman who left with bronze. The second bronze medal went to ZHUMAKANOV who never stopped working against European Championships bronze medallist Fabio BASILE (ITA). ZHUMAKANOV uprooted BASILE, 21, who was 26th on the Olympic qualification list coming into the event, with a tai-otoshi which had the crowd on their feet but the youngster turned out onto his front. The Italian was penalised for passivity and a false attack as the one-sided contest went to the home fighter.